For other uses, see Venera (disambiguation). This article is a rough translation from Russian. It may have been generated by a computer or by a translator without dual proficiency. Please help to enhance the translation. The original article is under "русский" in the "languages" sidebar. Location of Soviet Venus landers. Map based on mapping from space probe Pioneer Venus Orbiter. Position of Venera landing sites. Red points denote sites returning images from the surface, black central dots sites of surface sample analysis. Map based on mapping from Pioneer Venus Orbiter and Magellan. The Venera (Russian: Вене́ра, pronounced [vʲɪˈnʲɛrə]) are a series of space probes developed by the Soviet Union between 1961 and 1984 to gather data from Venus. The name Venera comes from the Russian name for Venus. Ten probes from the Venera series successfully landed on Venus and transmitted data from the surface of Venus, including the two Vega program and Venera-Halley probes. In addition, thirteen Venera probes successfully transmitted data from the atmosphere of Venus. Among other results, probes of the series became the first human-made devices to enter the atmosphere of another planet (Venera 4 on October 18, 1967), to make a soft landing on another planet (Venera 7 on December 15, 1970), to return images from the planetary surface (Venera 9 on June 8, 1975), and to perform high-resolution radar mapping studies of Venus (Venera 15 on June 2, 1983). The latter probes in the Venera series successfully carried out their mission, providing the first direct observations of the surface of Venus. Since the surface conditions on Venus are extreme, the probes only survived on the surface for durations varying between 23 minutes (initial probes) up to about 2 hours (final probes). The first Soviet attempt at a flyby probe to Venus was launched on February 4, 1961, but failed to leave Earth orbit. In keeping with the Soviet policy at that time of not announcing details of failed missions, the launch was announced under the name Tyazhely Sputnik ("Heavy Satellite"). It is also known as Venera 1VA. As with some of the Soviet Union's other planetary probes, the later versions were launched in pairs with a second vehicle launched soon after the first. Venera 1 and Venera 2 were intended to fly past Venus without entering orbit. Venera 1 was launched on February 12, 1961. Telemetry on the probe failed seven days after launch. It is believed to have passed within 100,000 km (62,000 mi) of Venus and remains in heliocentric orbit. Venera 2 launched on November 12, 1965, but also suffered a telemetry failure after leaving Earth orbit. Several other failed attempts at Venus flyby probes were launched by the Soviet Union in the early 1960s, but were not announced as planetary missions at the time, and hence did not officially receive the "Venera" designation. Venera station liquid based engine. The Venera 3 to 6 probes were similar. Weighing approximately one ton, and launched by the Molniya-type booster rocket, they included a cruise "bus" and a spherical atmospheric entry probe. The probes were optimised for atmospheric measurements, but not equipped with any special landing apparatus. Although it was hoped they would reach the surface still functioning, the first probes failed almost immediately, thereby disabling data transmission to Earth. Venera 3 became the first human-made object to impact another planet's surface as it crash-landed on March 1, 1966. However, as the spacecraft's dataprobes had failed upon atmospheric penetration, no data from within the Venusian boundary were retrieved from the mission. On 18 October 1967, Venera 4 became the first spacecraft to measure the atmosphere of another planet. While the Soviet Union initially claimed the craft reached the surface intact, re-analysis including atmospheric occultation data from the American Mariner 5 spacecraft that flew by Venus the day after its arrival demonstrated that Venus's surface pressure was 75-100 atmospheres, much higher than Venera 4's 25 atm hull strength, and the claim was retracted. Realizing the ships would be crushed before reaching the surface, the Soviets launched Venera 5 and Venera 6 as atmospheric probes. Designed to jettison nearly half their payload prior to entering the planet's atmosphere, these craft recorded 53 and 51 minutes of data, respectively, while slowly descending by parachute before their batteries failed. The Venera 7 probe was the first one designed to survive Venus surface conditions and to make a soft landing. Massively overbuilt to ensure survival, it had few experiments on board, and scientific output from the mission was further limited due to an internal switchboard failure which stuck in the "transmit temperature" position. Still, the control scientists succeeded in extrapolating the pressure (90 atm) from the temperature data with 465 °C (869 °F), which resulted from the first direct surface measurements. The Doppler measurements of the Venera 4 to 7 probes were the first evidence of the existence of high-speed zonal winds (up to 100 metres per second (330 ft/s) or 362 kilometres per hour (225 mph)) in the Venusian atmosphere (super rotation). Venera 7's parachute failed shortly before landing very close to the surface. It impacted at 17 metres per second (56 ft/s) and toppled over, but survived. Due to the resultant antenna misalignment, the radio signal was very weak, but was detected (with temperature telemetry) for 23 more minutes before its batteries expired. Thus, it became, on 15 December 1970, the first human-made probe to transmit data from the surface of Venus. Venera 8 was equipped with an extended set of scientific instruments for studying the surface (gamma-spectrometer etc.). The cruise bus of Venera 7 and 8 was similar to that of earlier ones, with the design ascending to the Zond 3 mission. The lander transmitted data during the descent and landed in sunlight. It measured the light level but had no camera. It transmitted data for almost an hour. The Venera 9 to 12 probes were of a different design. They weighed approximately five tons and were launched by the powerful Proton booster. They included a transfer and relay bus that had engines to brake into Venus orbit (Venera 9 and 10, 15 and 16) and to serve as receiver and relay for the entry probe's transmissions. The entry probe was attached to the top of the bus in a spherical heat shield. The probes were optimized for surface operations with an unusual looking design that included a spherical compartment to protect the electronics from atmospheric pressure and heat for as long as possible. Beneath this was a shock absorbing "crush ring" for landing. Above the pressure sphere was a cylindrical antenna structure and a wide dish shaped structure that resembled an antenna but was actually an aerobrake. They were designed to operate on the surface for a minimum of 30 minutes. Instruments varied on different missions, but included cameras and atmospheric and soil analysis equipment. All four landers had problems with some or all of their camera lens caps not releasing. The Venera 9 lander operated for at least 53 minutes and took pictures with one of two cameras; the other lens cap did not release. The Venera 10 lander operated for at least 65 minutes and took pictures with one of two cameras; the other lens cap did not release. The Venera 11 lander operated for at least 95 minutes but neither cameras' lens caps released. The Venera 12 lander operated for at least 110 minutes but neither cameras' lens caps released. The descent craft/lander contained most of the instrumentation and electronics, and was topped by an antenna. The design was similar to the earlier Venera 9–12 landers. They carried instruments to take scientific measurements of the ground and atmosphere once landed, including cameras, a microphone, a drill and surface sampler, and a seismometer. They also had instruments to record electric discharges during its descent phase through the Venusian atmosphere. The two descent craft landed about 950 km (590 mi) apart, just east of the eastern extension of an elevated region known as Phoebe Regio. The Venera 13 lander survived for 127 minutes, and the Venera 14 lander for 57 minutes, where the planned design life was only 32 minutes. The Venera 14 craft had the misfortune of ejecting the camera lens cap directly under the surface compressibility tester arm, and returned information for the compressibility of the lens cap rather than the surface. The descent vehicles transmitted data to the buses, which acted as data relays as they flew by Venus. Venera 15 and 16 were similar to previous probes, but the entry probes were replaced with surface imaging radar equipment. Radar imaging was necessary to penetrate the dense cloud of Venus. The VeGa (Cyrillic: ВеГа) probes to Venus and comet 1/P Halley launched in 1984 also used this basic Venera design, including landers but also atmospheric balloons which relayed data for about two days. "VeGa" is an agglutination of the words "Venera" (Venus in Russian) and "Gallei" (Halley in Russian). Venera-D is a proposed mission to Venus that would include a highly capable orbiter and a lander. From the standpoint of total mass delivered to Venus, the best launch opportunities occur in 2026 and 2031. Venera-D could incorporate some NASA components, including balloons, a subsatellite for plasma measurements, or a long-lived (24 hours) surface station on the lander. There were many scientific findings about Venus from the data retrieved by the Venera probes. For example, after analyzing the radar images returned from Venera 15 and 16, it was concluded that the ridges and grooves on the surface of Venus were the result of tectonic deformations. The Venera 9 and 10 landers had two cameras each. Only one functioned because the lens covers failed to separate from the second camera on each lander. The design was changed for Venera 11 and 12, but this change made the problem worse and all cameras failed on those missions. Venera 13 and 14 were the only landers on which all cameras worked properly; although unfortunately, the titanium lens cap on Venera 14 landed precisely on the area which was targeted by the soil compression probe. Venera 4 Atmospheric probe June 12, 1967 October 18, 1967 N/A The first probe to enter another planet's atmosphere and return data. Although it did not transmit from the surface, this was the first interplanetary transmission of any probe. Landed somewhere near latitude 19° N, longitude 38° E.
Venera 7 Lander August 17, 1970 December 15, 1970 23 The first successful landing of a spacecraft on another planet, and the first transmission from another planet's surface. Survived for 23 minutes before succumbing to heat and pressure. Venera 10 Orbiter and Lander June 14, 1975 October 25, 1975 65 Landed within a 150 kilometres (93 mi) radius of 15.42° N, 291.51° E.
Vega 1 Flyby and Lander December 15, 1984 June 11, 1985 N/A Part of the Vega program. The vessel was en route to Halley's Comet. During entry into atmosphere, the surface instruments began work early, and the lander failed. See Vega 1. Vega 2 Flyby and Lander December 21, 1984 June 15, 1985 56 Part of the Vega program. The vessel was en route to Halley's Comet. See Vega 2. ^ Wade, Mark. 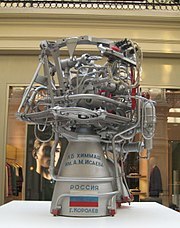 "Venera 1VA". Encyclopedia Astronautica. Archived from the original on 9 September 2010. Retrieved 28 July 2010. ^ Development of the Venera-D Mission Concept, from Science Objectives to Mission architecture. 49th Lunar and Planetary Science Conference 2018 (LPI Contrib. No. 2083). ^ Wall, Mike (17 January 2017). "Russia, US Mulling Joint Mission to Venus". Space. Retrieved 2017-10-29. ^ Senske, D.; Zasova, L. (31 January 2017). "Venera-D: Expanding our horizon of terrestrial planet climate and geology through the comprehensive exploration of Venus" (PDF). NASA. Retrieved 2017-10-29. ^ Basilevsky, A. T.; Pronin, A. A.; Ronca, L. B.; Kryuchkov, V. P.; Sukhanov, A. L.; Markov, M. S. (1986). "Styles of tectonic deformations of Venus - Analysis of Venera 15 and 16 data (abstract only)". Journal of Geophysical Research. Journal of Geophysical Research March 30, 1986, p. D399-D411. 91: 399. Bibcode:1986JGR....91..399B. doi:10.1029/JB091iB04p0D399. ISSN 0148-0227. ^ Huntress et all p. 49-266 op. cit. Wikimedia Commons has media related to Venera program.